MakeMKV for Mac is a Blu-ray ripping tool that can rip encrypted Blu-ray to MKV on Hard Drive free. Apart from Blu-ray, it also can copy DVD to Hard Drive free. As we all know, this software is designed to create MKV video files out the DVD and Blu-ray discs, preserves all audio and video tracks including HD audio, preserves chapters information, fast conversion, multi-platform and many more. For MakeMKV Mac users, here we cover comprehensive guide on how to rip DVD to MKV on Mac with MakeMKV for Mac, MakeMKV problems & solutions and best MakeMKV for Mac alternatives if the tool can't meet your demands. MakeMKV for Mac has been favored by many editors for its easiness in DVD to MKV ripping. Below is a guide on how to rip DVD to MKV using MakeMKV for Mac. The first thing you’ll need to do is download MakeMKV for Mac. You can click this link to go directly to the MakeMKV download page. The file size is right around 10 MB and will use up around 120 MB when installed. The program is pretty small and usually should finish downloading instantly if you've got a high-speed connection. Step 2: Once you've installed MakeMKV for Mac on your computer, insert your DVD disc and click on its image. MakeMKV for Mac will scan the disc looking for real titles rather than fake ones that might have been created to help protect the disc from copying. When it’s finished scanning it will present you with a list of chapter’s it’s found. Step 3: Select the one you want (the largest one in size) and click the Save Title button. On the sub menu, you can choose subtitles, audio you want for the output MKV file. Step 4: Choose output folder to save the output MKV video file. Step 5: Click "Make MKV" icon on the right side to start the DVD ripping process. When ripping DVD to MKV with MakeMKV for Mac following the steps above, you may find that there are some annoyance happened by chance. Here I gather some frequent problems and solutions about MakeMKV for Mac. Just keep reading. "Having sync issues after ripping DVD disc using MakeMKV for Mac. Any suggestions? Solution: Try to play the ripped MKV file with another MKV player. If the problem still exists, use VLC media player backward/forward function to make the video audio synchronized. Solution: Check out whether your DVD is damaged. If not, pity that it is probably the copy protection in the DVD that leads to MakeMKV for Mac not opening the disc. Restart MakeMKV for Mac. If this won't help, re download the MakeMKV for Mac latest version. Note that MakeMKV can't support macOS Sierra. 1. MakeMKV for Mac can not run on macOS Sierra currently. 2. Only output Blu-ray/DVD to MKV file format, but not other popular file formats, not to say device preset profile formats for your iPhone or iPad. 3. The resulted MKV file is as large as original Blu-ray or DVD media content, but the program does not give you an option to compress MKV files for better and convenient further usage. 4. Not supporting Blu-ray/DVD disc previewing function, so it would be hard for you to decide which is the correct main title to rip and which title should be ignored. 5. Lacks the audio track settings window, you have to convert Blu-ray/DVD with all the audio streams in original disc, even the one that you don't want to keep. This MakeMKV for Mac alternative is compatible with macOS High Sierra, macOS Sierra, Mac OS X 10.11 El Capitan, Mac OS X 10.10 Yosemite, 10.9 Mavericks, 10.8 Mountain Lion, 10.7 Lion, 10.6 Snow Leopard, etc. Allow users to configure the video and audio encoder codec, bitrate and video resolution, video frame rate, audio channel, audio sample rate. Before start to convert DVD to MKV, you also can edit the video files with the built-in video editor tool. As the best DVD Converter, Pavtube ByteCopy for Mac of course won't rip DVD to MKV only. It also can convert DVD to many other video and audio formats. 1:1 entire copy DVD disc to DVD Video-TS folder/ Directly copy DVD to VOB files. Re-encode DVD to SD/HD MOV, M4V,WMV, FLV, AVI,W MV, 3GP, TS, FLAC, MP3, AAC, AC3, etc. Transcode DVD to multi-track MOV/AVI/MP4 with multiple subtitle and audio tracks. 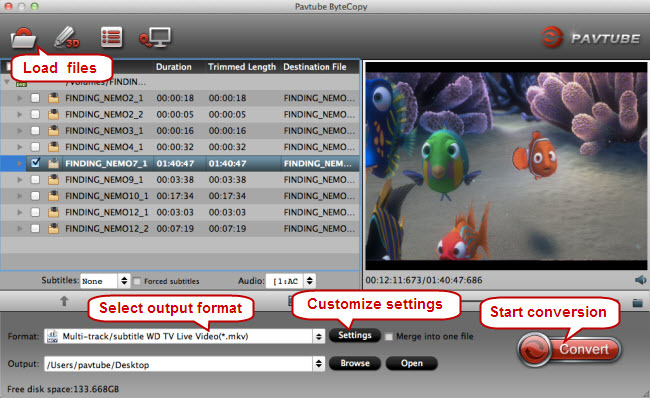 In short, you can easily rip DVD to various MKV with Pavtube ByteCopy for Mac. Apart from the aforementioned functions, Pavtube ByteCopy for mac has many other features, which are waiting you to discover. If you want to make MKV copies of DVD movies, just get a Pavtube ByteCopy for Mac. Want Windows Version? Please click here to get Pavtube ByteCopy.